Spent ages searching and this is the cheapest I can find. Also worming tablets for £1.60 each. i saw it on a couple saying prescription, didn't pay to much attention as its not what i normally buy. whats the difference? 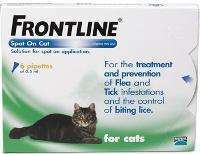 does anyone have any ideas on what to use if frontline didn't kill the fleas on thier moggy??? does anyone have any ideas on what to use if frontline didn't kill the … does anyone have any ideas on what to use if frontline didn't kill the fleas on thier moggy??? Advocate or Stronghold, both of those kill certain worms too I think they are both prescription only though. Don't know if it's the cheapest but it's a lot cheaper than my vet sells it and doesn't need a prescription. I ordered this 10 days ago. The thing with fleas is they lurk in carpets etc most of the time, so the cat is forever picking up new ones. We also use a flea comb and screwdriver to squash them. So you might think it doesn't work, but it does once a flea gets near it. Fiprospot Spot On Cat [6 x 0.5ml] with same ingredients as frontline - 20% off now £13.03 for pack of 6. Thanks guys for all the info, heat added! I've got 3 cats and can't get rid of the little blighters. Cats have always had frontline and its always worked but for a couple of months we've (cats) had fleas. Bought Fiprospot this time and they've had 2 each on this month and i've flead the house twice. Trouble is neighbourhood cats keep coming in, even found one sat upstairs on daughters bed. Bloody nightmare fleas, if its not the cats with fleas its the kids with nits lol. I've got 3 cats and can't get rid of the little blighters. Cats have … I've got 3 cats and can't get rid of the little blighters. Cats have always had frontline and its always worked but for a couple of months we've (cats) had fleas. Bought Fiprospot this time and they've had 2 each on this month and i've flead the house twice. Trouble is neighbourhood cats keep coming in, even found one sat upstairs on daughters bed. Bloody nightmare fleas, if its not the cats with fleas its the kids with nits lol. I've found the past 6 months standard frontline does nothing. What I really don't understand is how they get fleas when they don't even go out!! I'll try the frontline combo and see if that makes a difference unless someone can suggest a different product. when I went to book my cat in a cattery this year for our holidays, they wouldn't take him unless he had been treated with a prescription flea treatment. Apparently they had a huge problem the previous year with cats that had been treated with the frontline spot on, as opposed to the prescription only combo. Spot on may be cheaper, but it doesn't work as well, and no-one really wants fleas in their house - do they? We just got some Advocate from the vet - he recommended alternating with Frontline Combo to kill all nasties, including roundworm (that's from the Advocate) We'll see! It was eye-wateringly expensive though, so going to try and get further supplies online. Thanks for all the links here. If you do use Advocate, be aware that it leaves a lovely greasy patch on your cat that then gets transferred to whatever soft furnishings they flop out on. We now have a lovely big greasy mark on our duvet cover - although we thought at first she'd weed on it, so it could have been worse! A bit off topic I have just discovered that feeding your cat a main diet of canned tuna is not good for his health. I notice they sell appause cat food chicken pouch 12x70g for 9.59. Is that a good product for the price ? He is a mature (old) cat. Applaws is good food but also expensive - Personally don't think you can go wrong with natures menu at £18 for 24 pouches. I feed my cat dry food mainly with some natures menu every other month and a tin of tuna here and there, some will say they need wet food but he is now 3 years old and full of life, the vet says his health is perrrrfect, teeth, weight, coat etc all good. I wish my two cats would eat a variety. I have tried every brand and they only pick at dry food and will only eat Whiskers fish and not even the meat ones. Fussy mogs!